This sweet moccasin is designed with an easy-on elastic opening for a secure fit, perfect for babies and toddlers of all sizes. 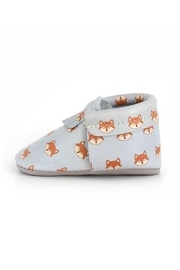 This style is made of ultra-soft leather with fringe details on tongue and an adorable fox print. A super cute addition to any wardrobe!